Today we are writing you to provide insight into a new mechanic you can expect to see next week, following the normally scheduled maintenance. As many of you are aware, the Value Package was recently introduced to our Pearl Store. After detailed discussions with the Developers at Pearl Abyss, it has been decided that the Value Pack as well as other Pearl Shop Items will be made available via the Market Place over the next series of updates. - Players might be allowed to register maximum of 5 Pearl Shop Items per week on the Market Place. We understand that this change will spark discussions, and have asked Pearl Abyss to share their thoughts behind this decision. Pearl Abyss considers in-game accessibility to Pearl Items necessary in Black Desert. Regardless of the region, there will always be players who, for whatever reason, do not get to experience all the features Black Desert offers including Pearl Shop Items. Adding a mechanic that grants access to Pearl Shop Items with in game currency will allow more players to enjoy such content more easily. For the same reason, the players of other regions like Korea, Japan and Russia are preferring those features since it allows them better accessibility to Pearl Shop Items. We are open to the community’s feedback and we encourage you to share your thoughts and concerns in a constructive manner on this change. NOTE: The previous announcement has been polished in order to deliver and clarify the intention better. So, how much Silver do I get for 5 Costume Sets = 14.500 Pearls (130€) per week? edit: you refuse to add in valk cries yet you add cash shop items that can be sold on the marketplace - wheres the logic behind that? Will we be able to sell already "opened" costumes (aka already character bound)? Where can I request a refund? Just email support and wait the usual 2-4 weeks for a response or what? EDIT: "For the same reason, the players of other regions like Korea, Japan and Russia are preferring those features since it allows them better accessibility to Pearl Shop Items." EDIT 3: For real though, gimme back my money you lying, thieving degenerates. Since I managed to snipe a pretty good spot on top here, let me give you some candy. I don't know how to possibly say: "Black Desert is not going to be a Pay-to-Win game." or game with "free to play, pay to win anthics" any more clearly. This also contains some juicy statement about the cash shop pricing. Because prices clearly don't need to be that high, since people already paid upfront. Uhuh. Funniest part is, that dude is actually laughing about ArcheAge for "failing" due to their payment model. Hah. Who thought someone could be stupid enough to make THAT mistake again. Edit : 5 items per week or not, it will depends on the exchange rate. If you pay let's say 30€ for 1 item that you can sell for 1m max on the auction house, it limits you to 5m per weeks. I'm totally fine with that because it won't change anything to the current game. But if you can sell a costume that costs 30€ for a lot more, let's say 100m, you can make 500m per week ? Yea it will obviously change the balance of the game. Let's hope you revert this change or put some really low low low low exchange rate like a said in the first place : that won't change anything in the game. Edit2: Instead of saying "this is for accessibility", because honestly, you could put those costumes in loyalties for like 50 days or something. You just want to grab all the money you can. Update? : So in korea, japan and russia players like P2W... Did they also buy the game where it said somehow "no P2W in it" ? To be honest, the player base in BDO KR/JAP/RU are probably players that don't mind P2W, because before PLAYING THE GAME, they KNEW it was P2W which is why you have positive reviews about that "mechanic" in those regions. Don't think this is a wise decision. Basically every single game i have ever played that starts doing to much of this "p2w" dies out very quickly... I would much rather see and pay for a subscription based game than having all of these options to trade real money for in-game advantages. Limiting it to 5 items is not going to change anything, people just find the most expensive items to sell and cash in that sweet ingame $$. 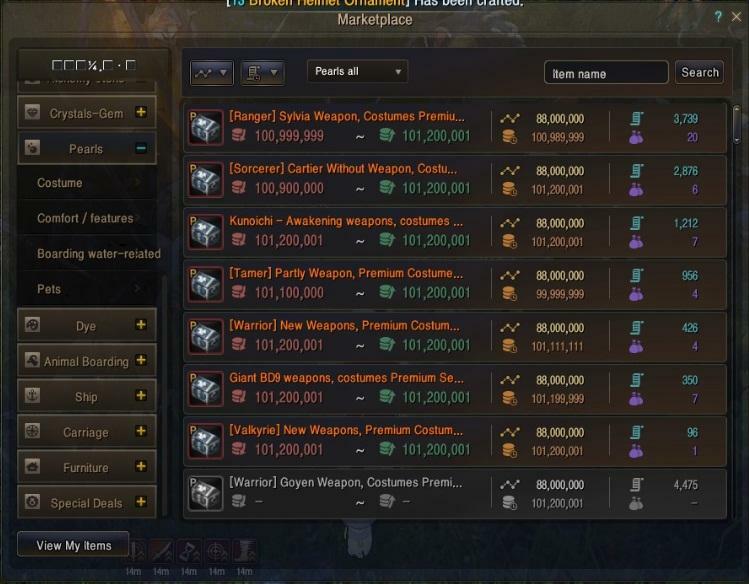 Brace for TET Ogre Ring and PEN weapons guys. If dyes sell for 5 mil (50 peal box), will 3k pearl costumes sell for 300 mil? That is 1.5 billion you can get with credit card? Full P2W! @PM_Jouska you're a -----ing joke! "Some market watchers, however, said Kakao has been investing in games to use them as a cash cow while shifting its focus into the online-to-offline, or O2O, business that draws potential customers from online channels to physical stores. “The O2O business, which is considered Kakao’s future growth engine, needs some time to generate profits. The game business appears intended as a temporary cash cow.” said Kim Dong-hee, an analyst from Meritz Securities. " Really interested to see how this goes. So any news on Blessing of Kamasilve in pearl-shop? I always get envious when I see KR and RU players having this buff permanently up. How do i get a refund after there statement of "we will never go p2w"
As we have stressed in the past, your feedback is paramount to us, and that is still true. We encourage you to share your thoughts on this change as Pearl Abyss has requested. However, we ask that you do so in a non-abusive but constructive manner. We will continue to communicate on your behalf, and thank you in advance for your efforts. Delete the post and just don't introduce that into the game? Popcorn! Get your popcorn! Salted, Sweet, Caramel, you name it we got it! Can I get my money back and some extra cash for continuous disregard of your playerbase, pretty please? Time to smear some poop over Daum and PA headquarters. @PM_Jouska you lied to us.